What do you see when you look at a regularly textured surface? Do you see tiles or do you see structures? This project is developing a computational model for repeated pattern perception that is able to automatically classify a given pattern into one of the 7 frieze groups, one of the 17 wallpaper groups, or one of the 230 space groups. It can also automatically generate a finite set of possible tiles (based on our theoretical proofs). 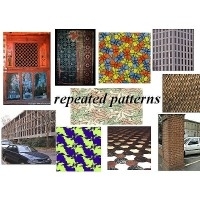 Furthermore, we study repeated patterns under different viewing directions to find out what happens to a periodic pattern when it is deformed by Affine or perspective transformations. We are also exploring texture replacement in real images and texture synthesis.